The first frosts of autumn 2012. After a very mild period the warm air has rushed back down to North Africa or wherever it came from, leaving a vacuum to be filled by cold winds from the far north of Europe and Russia. The Mediterranean regions have been experiencing violent storms and rain in unreasonable quantities (“a month’s rain in an hour” and similar phrases are frequently heard on weather reports) confirming the wisdom of our choice of region to settle in. Not for us the extremes of other parts of France. In the meantime the east coast of the United States is being battered by hurricane Sandy. The first frost last night touched some of the more tender plants and I have been out collecting pots from the garden and putting them under cover, either in the unheated conservatory at the front of the house or in the cabin in the back garden. Here, I have constructed a bench from an old cupboard door laid over a couple of desks, in front of a large, south facing window. Electric heaters should keep plants cosy at around 12°C over winter: ideal from Geraniums, Fuchsias, Salvias, Brugmansia, Abutilon and the like, of which we have plenty. Our so-called hardy banana has been wrapped up in straw and fleece in an attempt to keep it alive out-of-doors. Time will tell if this was the wisest approach. It is also time to lift the Dahlias and Cannas to get them stored in boxes of leaf mould away from the cold for the season. Dahlias will often overwinter in the ground here – we generally leave Gladioli in the beds too – but I have also lost a few. Perhaps this technique of lifting and overwintering will ensure greater survival rates. Thompson and Morgan have suggested in a recent newsletter that gardeners should be sowing seeds of perennials now, leaving them to germinate in a cold-frame. I shall have a look to see what packets of seed I might have and give this a go. I have collected Lilium regale seed as I did last year and have it in mind to sow a few ornamental grasses like Purple Millet, but I may have to fight off the birds feeding on the seed-heads! Our old conservatory should serve very well as a cold-frame. Pyracantha berries sparkling in the clear autumn sun today. It’s turning into a very good year for Pyracantha this year, with huge crops of berries in a range of bright colours on plants throughout the town. We have just one named hybrid in the garden, which I am patiently training along an ugly concrete boundary fence, but several which have arrived as seedlings thanks to the gardening efforts of wild birds. The photograph is of one of a pair in an abandoned garden in the square close to our house. The other was eaten by a camel when the circus came to town, but is recovering well!. Red, orange and yellow berried forms can all be seen in local gardens and it is often used as a thorny boundary hedge. Mixed berry colour hedges can look particularly attractive but some care has to be exercised when pruning to ensure they produce flowers and berries. Somehow we all knew it would end in tears. The weather has been milder than Nature intended throughout the winter; plants have been flowering unseasonably and the summer bedding seems to have hardly noticed the passing of the months. Farmers, growers and gardeners, while perhaps enjoying the show, have been nervous for some time, fearing damage to blossoms and the ruining of crops when and if the weather finally turned cold. Peach and Apricot growers in the South-West have featured on the evening news, looking more than a little concerned. Yesterday the snow arrived and we are told that not far behind are bitter Siberian winds. Walking the dog in the countryside has been a pleasure however, with the sun out and photogenic scenes at every turn. In the meantime the local gardening shop’s promotional brochure arrived today, highlighting the agrarian nature of this country and its people. The leaflet features seed potatoes, nothing unusual there, but also rotavators with reversible plough attachments, bee hives – the real thing, not ornaments – and hatching equipment for your chicken eggs. When was the last time you saw these in your local Wyevale? Not to be left out, the hypermarket is offering above-ground swimming pools, ride-on mowers and a range of rainwater recovery kits, including one utilising linked underground storage tanks, each of 2650L capacity. Gardening is different in France, but just as big as in the UK. Loire Valley gardens and the first seed sowing. We are hardly into January and already it feels like spring: we are getting busier on all fronts. There has been such interest in our study tours of the Loire Valley that I have been panicked into resuming work on a web site I started last year – Loire Valley Gardens– in which I describe the gardens of the region, listed by department (county). This web site started its life programmed in a heady mix of Flash, html and css and was so complex I had to give it up as beyond my capabilities. I eventually settled on a far more simple style and, just as importantly, a more straightforward coding method, but wasted so much time with the first version that I ran out of time to complete it. At the moment I describe 15 gardens of the Loire valley on the site, with the gardens of the chateau La Chatonniere my latest. This is an amazing place with twelve themed gardens – the French do like a theme, the artier the better – surrounding a beautiful Renaissance castle. I won’t say more here: you can look at the details on the site if you are interested http://www.loirevalleygardens.com/chatonniere.html . I am looking forward to seeing how the gardens are progressing in 2012 and to learn if they have plans for more themes. The last major development was in in 2008 when The Garden of Luxuriance was built to feature 400 David Austin roses, adding to the collections of roses displayed in other areas. 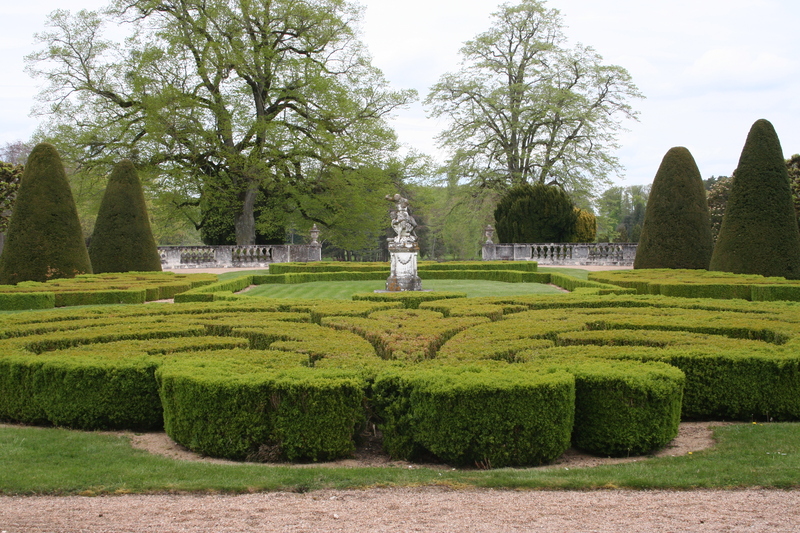 Soon Loire Valley Gardens will list and describe thirty-four gardens. As I revisit these gardens and discover more the site will continue grow and I hope this will prove a useful resource for clients, students and others interested in this fascinating region. The first of my seeds are now sown and in the propagator: Begonias, Antirrhinums and Coleus, all absurdly small seeds which are applied as a ‘dust’ to the surface of moist compost. There are around 88,000 Begonia seeds per gram making them difficult to see and to sow, even with modern, sophisticated machinery. In my days as a grower we had a machine which would sow them from a series of units dropping four or five at a time and with the bounce as they hit the compost created a pretty good covering of a seed tray. Begonia seed is very expensive but we also sold plants in compost plugs and it was important to only have one or two seedlings in each if we were to make a profit. For these we resorted to pelleted seed, each grain being given a coating of clay which allowed our seed sowing equipment to place them one by one at the centre of each plug. All clever stuff. One of the Begonia varieties I sowed this week was pelleted seed: Torbay Mix, from Suttons. Antirrhinums are large by comparison to Begonias – 7,500 to the gram and Coleus is around the same, but they are still hard to work with. When my order of Vermiculite finally arrives from EBay I shall get the Geranium seeds done – 200 seeds per gram – even I can see these! An unusual task this week will be to dismantle the seasonal display of foliage and berries we constructed in the conservatory for Christmas; I have my eyes on the berries of the Butcher’s Broom and plan to sow them under the Sequoias. The branches of this plant were collected from plants found in local woods, so I have every hope they will do well. If the squirrel leaves them alone we can expect a patch of these adaptable plants for next year and by sowing a large number of seeds hope to have both male and female plants, giving berries for many a Christmas to come. I don’t know about you, but this time of the year always encourages introspection and navel gazing in this gardener. 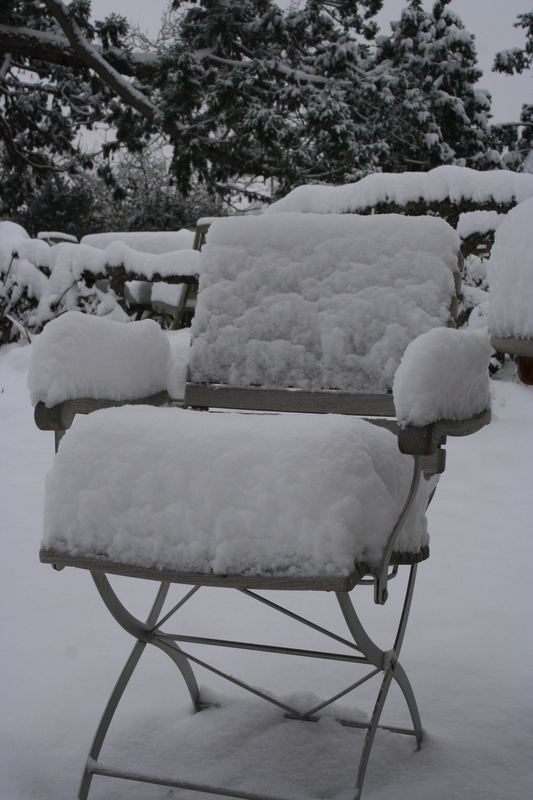 It’s partly the enforced idleness, with freezing conditions, snow and rain keeping me inside and partly the lack of sun, warmth and vitamin D. New Year parties have never excited me: I just want to get back to work and get outside in the garden. I had been brooding yet again over garden design as a maligned and misunderstood art, when up popped an offer of work by email. I have been cultivating a valuable contact in China for many years and he has an offer for me. I was asked to come up with proposals and drawings for the landscaping of a 120,00 sq.m. luxury housing development; I had 10 days to complete it, no budget, no design brief, no visit or photographs: just a “read only” Autocad plan of the site with notation in Chinese. A rough sketch would do, I was told, with a design fee offer at around one twentieth my rate for the full plans. It’s a competitive tender and my drawings will be key to winning the contract. I’ll do what I can, of course; I can come up with ideas – I have theories and a rough scheme in mind – but give up Christmas to create a plan and visuals good enough to win a major contract? I don’t think so. A scene in the book by Antoine de Saint-Exupéry, the Little Prince, comes to mind. The Little Prince demands that the narrator draws him a sheep. After three attempts at drawing sheep are rejected, he draws a box: ” The sheep you wanted is in the box” the narrator explains. Little Prince is delighted with the result. Perhaps I’m missing a trick here. I’m not sure where this meditation is leading, accept to say that I understand that in the great scheme of things garden design is a luxury permitted the wealthy nations and if it disappeared tomorrow humanity would probably muddle through somehow; but if I am going to design gardens I like to do the best I can: it’s an art that takes time and patience, extensive knowledge across a range of disciplines, experience, proficiency and (in all modesty!) talent. As a result, it’s also going to cost you. This is the time of the year when I write books and courses, design and redesign our web sites and plan our business for the following season. All of these things are connected and one of our big projects revolves around the gardens of the Loire Valley. We are introducing garden tours to the Garden Design Academy and being close to many of the finest, these are to be the subject of our next book and, we hope, a series of tours for garden enthusiasts. The web page is launched and a full site may follow. The Loire Valley region of central France is known throughout the world for its chateaux – the ancient homes of the kings and aristocracy of France. It is also an area of great natural beauty and it was in recognition of the regions balance between architectural heritage and the natural environment that UNESCO has listed the Loire Valley as a World Heritage Site for its cultural landscape. The parks and gardens of the region are equally well regarded, often enhancing the chateaux which have made central France famous. 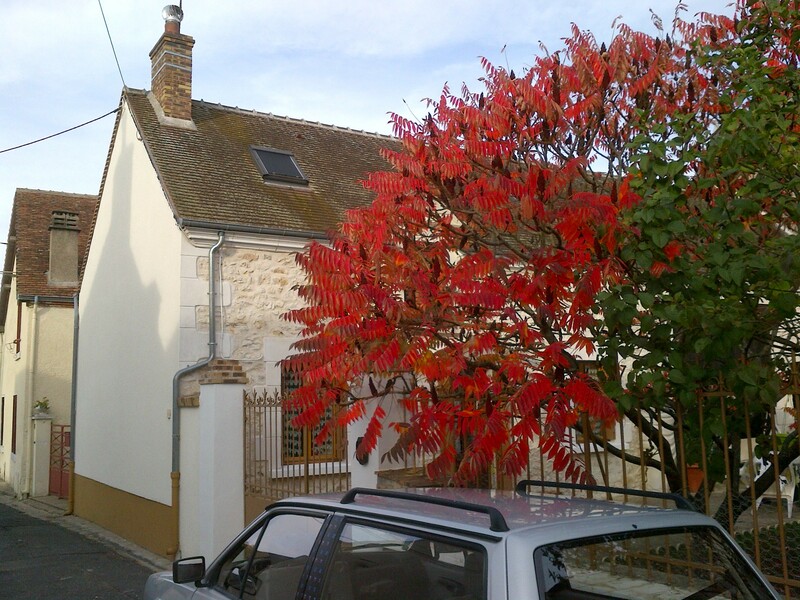 Our home in northern Indre is surrounded by many of the great gardens of France. Several dozen of the best are within 2 hours drive and some are just around the corner. We are very excited about the possibilities and have already been approached by one UK-based company to lead tours in the region. Creating a new garden is wonderful, but one of the frustrations of a young garden is the lack of cutting material for the house. This seems especially true during the winter, when it is delightful to bring a little home-grown colour and scent inside. We have planted evergreens and winter flowering plants of course, but there is not enough and they are far too small to spare the quantities needed for regular floral displays. We have therefore been looking to the countryside and to neighbours gardens for material, with limited success. 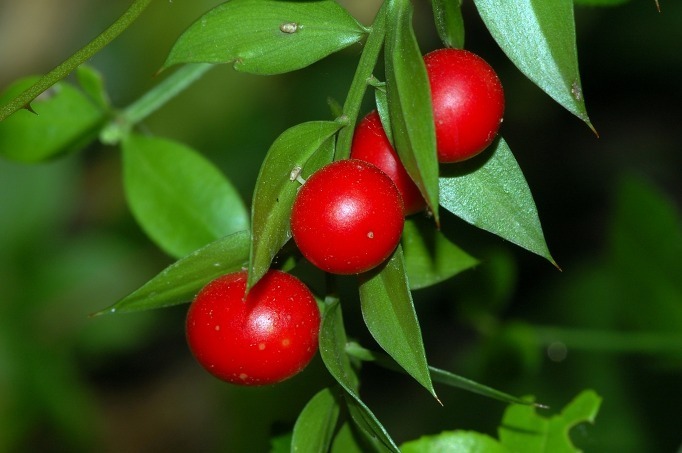 Braving the snow and the cold we have cut flowering branches of Ivy from the boundary wall, Ruscus aculeatus (Butcher’s Broom) complete with a berry or two from the woods and huge balls of Mistletoe, which is plentiful in France. 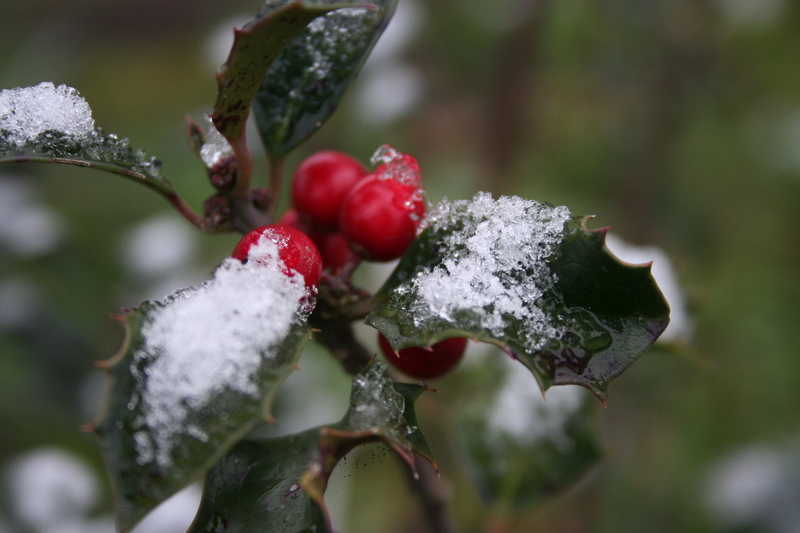 Holly, a common wild plant in the UK and a traditional Christmas cutting plant, is rare in these parts. I can think of none in the woods and hedgerows nearby and in the village there can’t be more than three or four cultivated plants; this year I have seen no berries either. 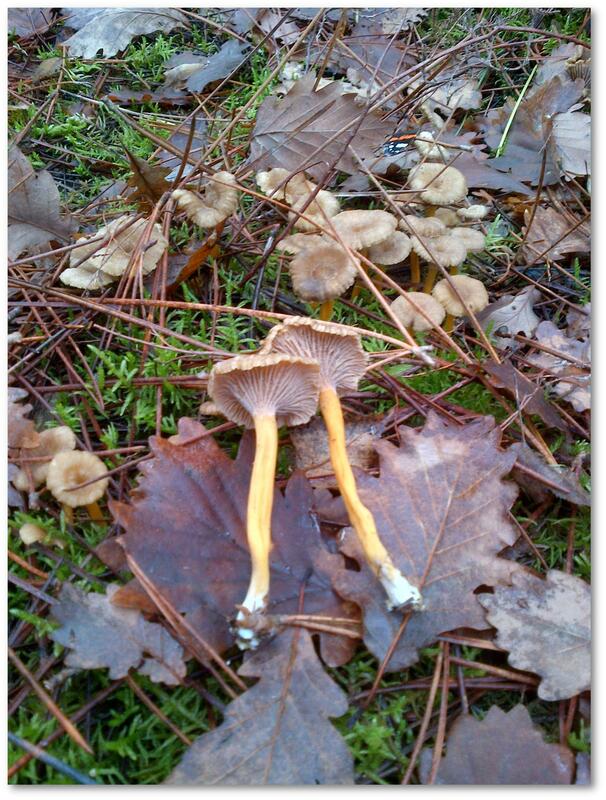 Autumn is a gorgeous time of the year here in Le Centre, bringing mushrooms, the grape harvest, wild game and relief from the heat of summer. It is a time of harvest festivals celebrating everything from Berry green lentils, to apples and pumpkins and, it seems, life in general. And all of this is played out against a backdrop of rich autumn colour from cultivated as well as wild trees and shrubs. France is a good country to see truly spectacular displays of autumn colour. So often the weather is fine at this time of the year, giving the ideal combination of sunny days and cool nights. Here in the Indre, we are surrounded by forests of oak, birch, hornbeam and other trees and nearby chateau parkland hosts fine, old heirloom trees that put on a magnificent display each year. But autumn colour is not just for grand spaces – it can be created in your own garden, giving you a display that is every bit as exciting. For many people planting in the garden often revolves around the spring and summer months – but autumn too is a time when the garden can be a place of real beauty. Between our gardens at home and those we have planted for clients we grow a very wide selection of plants exhibiting autumn foliage colour and I am always disappointed when we are asked for a garden that is largely evergreen. When a garden does not change with the seasons, one misses out on the wonderful transformations that come with a natural landscape. 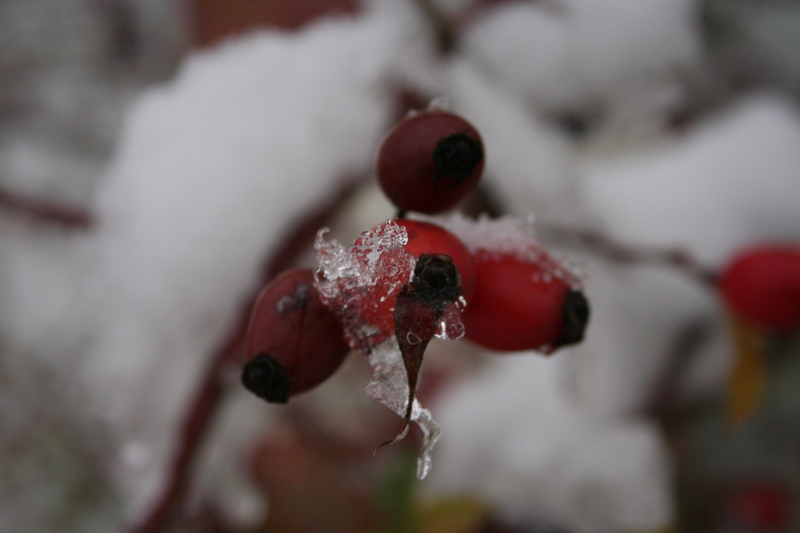 Our best area at home features both trees and shrubs with many, such as Sorbus, also carrying berries. With a background of hawthorn and hornbeam hedges, pride of place must go to the Japanese maples, of which we have four sorts including the deeply cut foliage of our old Acer palmatum atropurpureum, currently turning deep crimson. Even more spectacular is Cotinus grace, now a huge bush after five happy years with us and Euonymus europaeus Red Cascade, a variety of our native spindle bush which grows wild in the countryside and gives us both colourful leaves and fruits. 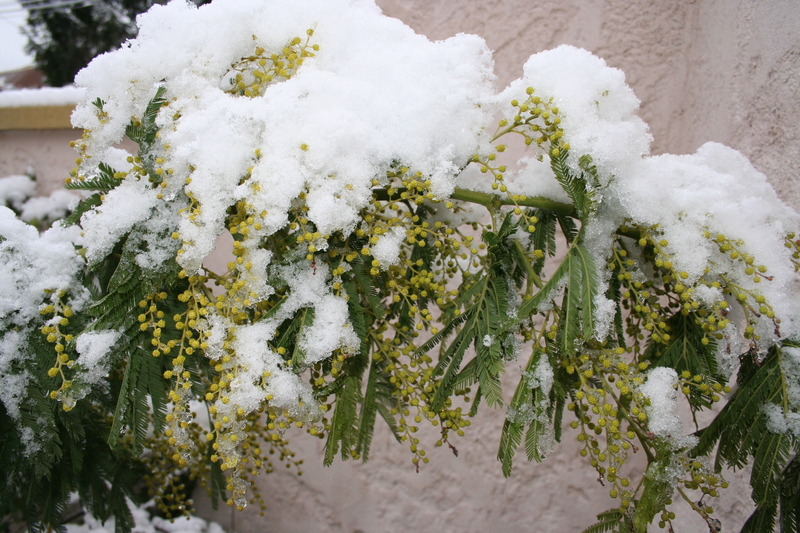 Part of the skill of a garden designer is to exploit plants to enhance seasonal effects. For me, there are two ways to use autumn colour well. The first is to scatter appropriate plants throughout the garden so that the eye is drawn from one plant to the next in a visual journey. 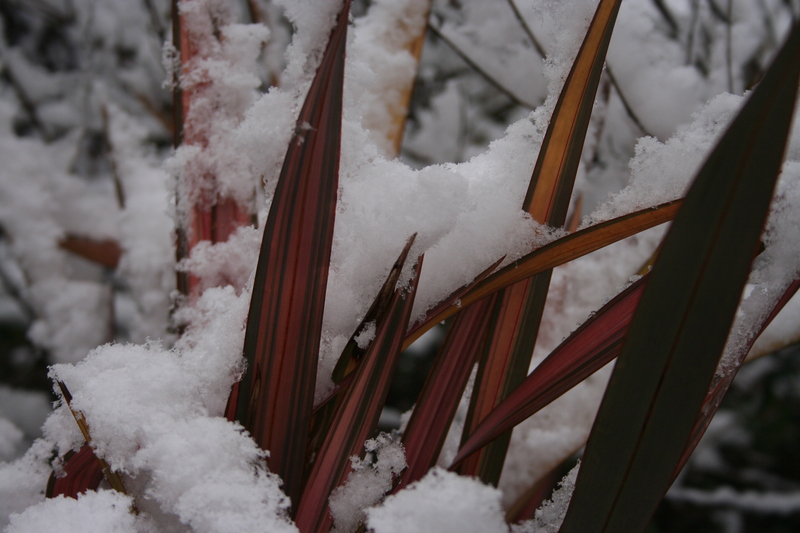 This technique sounds simple enough but with so many other factors to consider it can be difficult to achieve without compromising other planting – having carefully created a ‘white garden’ for instance, bright red autumn colour in this same area may come as a bit of a shock. And autumn colour viewed against a background of dead and dying herbaceous plants will inevitably detract from the effect unless you cut back to clear the area around them. When designing your borders keep autumn in mind and if you have not included something autumnal by the time you are halfway down the bed, now is the time to add something. A deciduous Berberis here, a group of Ceratostigma there, adds areas of red and orange to the scene and creates hot spots of colour throughout the garden. For those with a mature garden consider removing one or two under-performing plants and replace with a clump of ornamental grasses or perhaps a small tree such as Prunus subhirtella Autumnalis, which provides both autumn foliage and flower. If you have the space it may be easier to take the dramatic approach – concentrating plants within a section to create an autumn garden. As leaf colour changes day by day there is little need to select specific shades when a wild mixture of plants creates the most exciting display. Given the time of the year it would be worth constructing pathways to make it comfortable to reach, while a gazebo, summerhouse or other ‘abri de jardin’ would create a cosy spot to view the colours. The Japanese often design viewing points into their gardens: a place to linger and appreciate the scene that has been carefully crafted for visitors. While I have suggested the use of coloured foliage, there are also plants with berries and flowers at this time of the year and your autumn garden might also contain some of these to extend the all too fleeting period of display from the changing leaves. An example of this type of garden might include a tree, Liquidambar in a larger garden, Rhus or Amelanchier if space is limited. Liquidambar with its Maple-like leaves is a favourite here in France, while Amelanchier boasts attractive shrimp-pink new leaves, white flowers and black berries in addition to its bright red autumn leaf colour. Common Rhus is lovely but we have just planted the variety Tigers Eyes which promises spectacular leaf colour from a more modest sized tree. Next we might add a shrub and Arbutus could fit the bill very well. It is evergreen and at this time of the year carries both Lily of the Valley-like flowers and fruits which resemble strawberries. More flower and scent too, could be added using rose pink Viburnum bodnatense Dawn, which will continue to give pleasure throughout the winter. Down at ground level you could try the Autumn Crocus or Colchicum, with huge pink or white flowers. Waterlily is a double variety which has given us much pleasure over the years. In between these a few herbaceous perennials: Anemones like September Charm, and perhaps a few grasses. In our last English garden we had a huge clump of Cortaderia richardii, a form of Pampas from New Zealand, but also Miscanthus in several varieties, Pennisetum and others, all adding to the beauty of the garden with their feathery flower panicles. While our new autumn garden is young you could fill in the gaps with some Pansies, but the allocated space will soon fill and give pleasure for years to come. I am always being asked for my favourite plants – a impossible request when I love so many and my choice changes faster than the seasons – but I will suggest a few you might like to try. • Liquidambar (Sweet Gum) with maple-like leaves and corky bark, leaf colour in good forms is crimson and gold. Beware of cheap seedling-grown plants which may not colour well; try Worplesdon or some other known variety. • Quercus rubra (or Red Oak) is a large tree planted extensively in local woodlands. Best colour is on lime-free soil. • Sorbus aucuparia Asplenifolia has both orange berries and bright red foliage in the autumn. 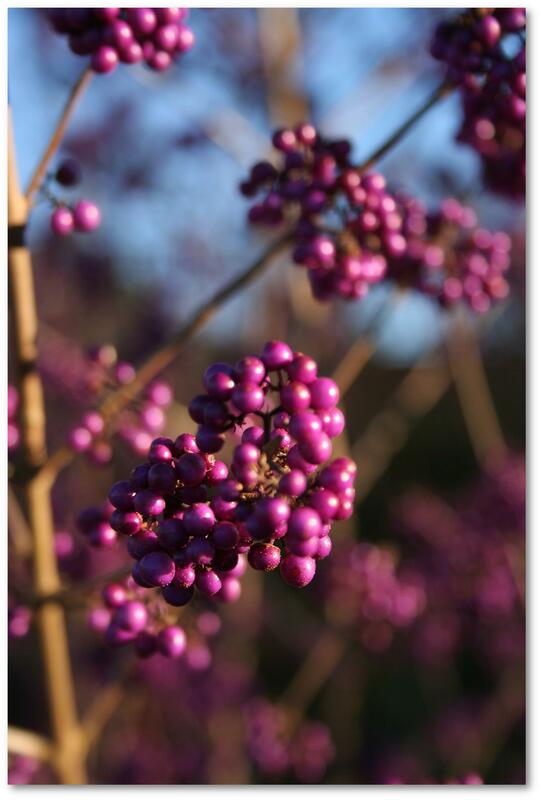 There are many other types of Sorbus, all of them worth considering. • Acer japonicum Aconitifolium and other Japanese Maples for attractive cut foliage turning crimson. Best in a little shade. • Cotinus coggygria Grace is a spectacular variety of the Smoke Tree, native to the south of France, with purple-red foliage turning scarlet. The leaves are translucent so if you can, position it to be viewed in the evening sun. • Deciduous forms of Azalea colour richly with yellow, orange and crimson forms according to variety. Bright flowers in the spring, often sweetly scented. If you have the space and soil which is not chalky, grow lots! • Hebe Great Orme. A superb evergreen shrub whose pink and white flowers are produced over a very long period, often to Christmas. • Kaffir Lily, Schizostylis, a South African bulb flowering in shades of pink and ideal for a warm spot. • Anemone hybrida Honorine Jobert with pure white flowers and yellow stamens, looking lovely next to Maples in our garden. • Miscanthus sinensis Zebrinus. A late flowering grass with gold bands decorating the leaves. Great in cut flower arrangements. 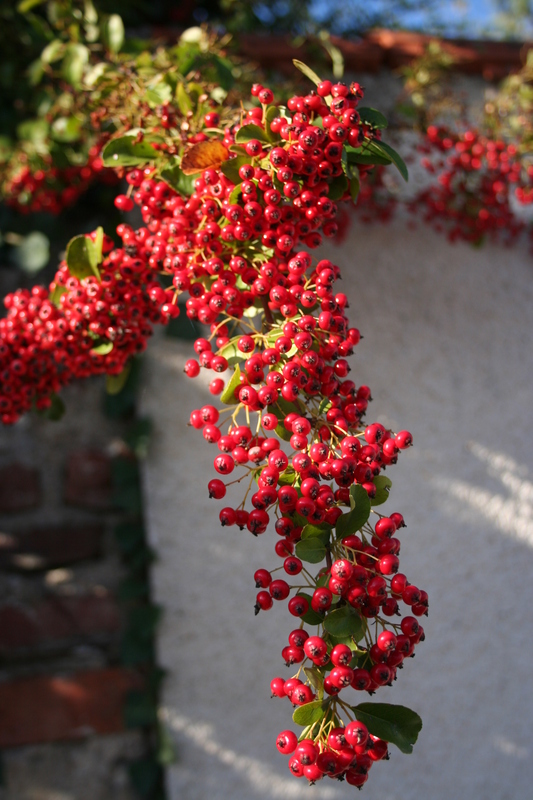 • Pyracantha is a spiny shrub often trained against walls or used as a hedge. Stunning crops of yellow, orange or red berries. The birds will thank you for it. 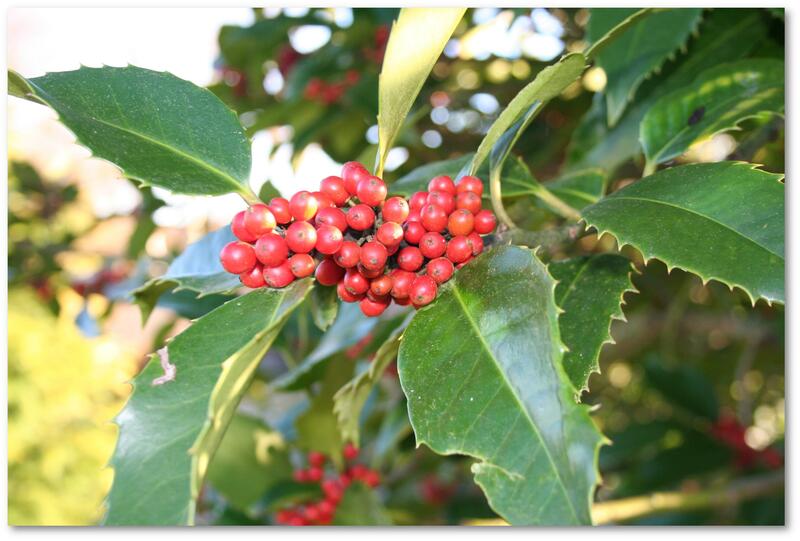 • Pernettya: highly decorative berries on small evergreen bushes, but only for acid soils. • Malus. Crab Apples in a wide range of forms, but generally ideal for a small garden. I’m fond of yellow fruited Golden Hornet.